Dubai offers an extensive variety of cuisines, but there's always a point when I want nothing but a good ol' Filipino meal. Since my kitchen prowess is very limited, Ed and I would dine out whenever we crave for a special dish from home. It is very heart-warming to see new Filipino restaurants in this culturally diverse city. The more options we have, the merrier! Recently, I stumbled across a new Asian restaurant specializing in Filipino cuisine. Soy and Pepper in Reef Mall seems like another restaurant to love as two of my blogger friends already posted that it could be the next big thing in town. So there I was, drooling over Soy and Pepper's chicken sisig on Instagram, wanting to try it the soonest. Surprisingly, on the very same day that Soy and Pepper lured me through a microblogging site, an invitation to dine at the restaurant arrived in my Facebook Page's inbox! I guess it's really true that when you want something, the universe conspires to make it happen... and when you get lucky, it happens in just a snap! :) I accepted the invite with a big grin on my face and the thoughts of chicken sisig still in my head. Ed and I visited Soy and Pepper at Reef Mall's ground floor on a Saturday night. The restaurant is beside Dome Cafe; where a bookstore managed by my cousin used to be. I had mixed feelings when I saw tables and chairs instead of bookshelves that I used to clutter during my newbie/unemployed days. On the bright side, at least it was replaced by a lovely restaurant that carries the tagline 'Fun Asian Cuisine'. So, I brushed off the drama and embraced the fun dining that Soy and Pepper promises. After receiving such a warm welcome, the restaurant's manager guided us to a table. She gave us the menu and an iPad where we can browse the photos of some of the dishes they offer. Very techie! She patiently assisted us and recommended Soy and Pepper's bestsellers, including the chicken sisig that I couldn't take off my mind. Since we were both having Filipino classics as main dishes, we opted to have Thai and Chinese appetizers. The Thai Salad with cashew nuts gave our hearty meal a vibrant start! It is a healthy bowl of crisp thin slices of cucumber and carrots, tossed with fresh basil, coriander leaves, capsicum, cashew nuts and drizzled with a zesty Thai dressing. It tastes as scrumptious as it looks! Ed ordered chicken siomai which was served in a bamboo steamer. A serving has three freshly-steamed and very flavorful dumplings in XL sizes. Then, the superstars of Soy and Pepper arrived on our table. My Chicken Sisig and Ed's Beef Caldereta were served hot and sizzling! Just by the mere sight and sound of the crackles, I can already tell that Soy and Pepper is not just another Asian restaurant. They served the Filipino classic dishes with a twist! 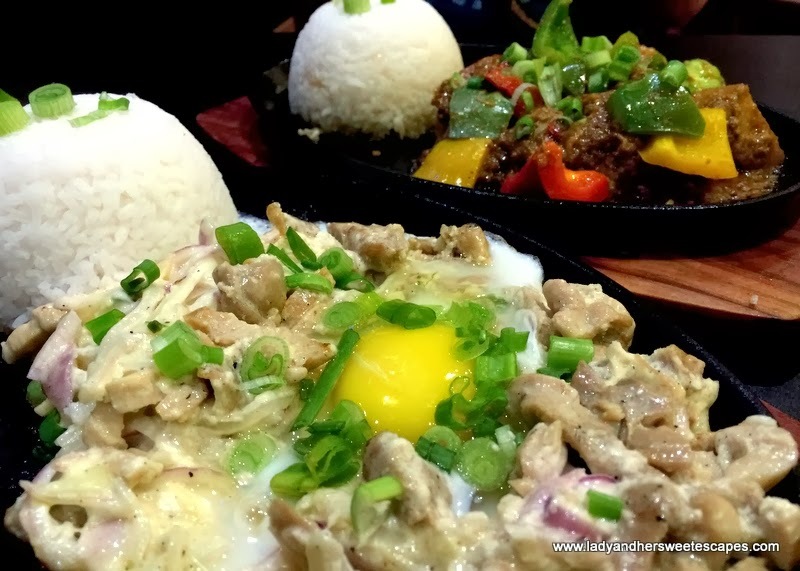 The chicken sisig is not overpowered with spices like the ones back home. It is a milder version, yet still full on flavour. While I was devouring the dish that I was longing for weeks, my husband bugged me to have a portion of the sizzling beef caldereta he was having. Apart from being the only caldereta we've seen on a sizzling plate, it is also one of the bests we've ever had; tender, savory and insanely delicious! I had a classic Filipino beverage, Black Gulaman. I love that it was not loaded with crushed ice. It is sweet and simply refreshing, a perfect match to the savory chicken sisig! I couldn't speak for my husband's chosen drink, Lemon Iced Tea. But hearing no complains from a hard-to-please guy, I bet it's good as well! Our hearty dinner ended with the ultimate Filipino desserts. Growing up, I was never a fan of ube-flavored desserts, but I found Soy and Pepper's Purple Yam Jam fantastic! I love the velvety texture and the luscious taste. The Leche Flan, a Filipino version of caramel custard, is smooth and creamy with the right boost of sweet caramel flavour. We had the pleasure of meeting Chef Jeff, the man behind Soy and Pepper's delicious dishes. We already fell in love with the restaurant's unique way of serving Filipino classics, and to hear him speak about the concept and his culinary standards made us appreciate each dish even more. He cooks the dishes in a traditional Filipino way, with only the freshest ingredients and natural flavour enhancers! With more and more Filipino restaurants opening in the city, it takes a lot to stand out from the rest. It must have a distinct concept. It should be fancy and affordable at the same time to woo me and the rest of the Filipino community. I must say, Soy and Pepper hits the spot. They serve the comfort food we all know, but with additional sprinkles of fun and uniqueness. Soy and Pepper is definitely one of the Asian restaurants that deserves to be in the limelight! Planning to dine soon? 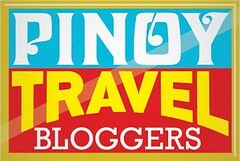 Like Soy and Pepper's Facebook Page and watch out for current dining promotions. Participate in their fun trivia games and competitions to receive special discounts! wow. parang ang sarap. nakakasawa na kasi ang chowking and barrio fiesta. Check it out before you leave! :) Planning to go back soon to have their chicken inasal.